Clone a 2.5in/3.5in SATA drive without a host computer connection, or dock the drives over USB 3.0 for easy access. 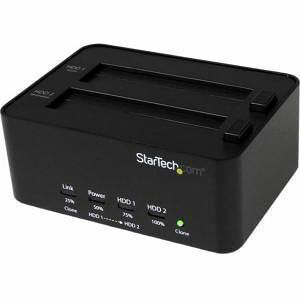 The SATDOCK2REU3 USB 3.0 Standalone Duplicator and Eraser Dock lets you connect your 2.5in/3.5in SATA HDDs or SSDs through SuperSpeed USB 3.0, with the ability to swap drives in and out as needed. The dock also functions as a standalone drive duplicator and eraser - an efficient and versatile solution for external drive management. Featuring standalone Sector by Sector hard drive duplication with built-in LED progress bar, and support for 2 drive single pass over writing the SATDOCK22EU3 is a user-friendly all-in-one solution for any application requiring hard drive duplication or erasing. With support for SATA I/II/III, and large capacity drives (tested up to 4TB) this HDD/SSD docking station is compatible with virtually any SATA hard drive, and greatly increases the storage/backup capabilities of your computer. The SATDOCK2REU3 is backed by a 2-year StarTech.com warranty and free lifetime technical support.